No more having to go through your workouts lacking energy, focus, and motivation. IdealLean Pre-Workout was created to take your training results to a whole new level of intensity. 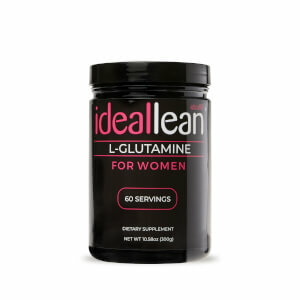 Formulated especially for women, IdealLean Pre-Workout features ingredients like Phosphatidylserine and Green Tea Extract standardized to provide 50% EGCG, to help support your fitness goals! To get the best results possible, you need to workout hard and smart. IdealLean Pre-Workout packs ingredients to help support the mental and physical aspects of training, so you can unlock your full training potential. With ingredients to help support your energy, mood, and focus, you'll be able to push yourself even further. Love this pre workout and the kick it gives me to get in an amazing workout! I’ve tried all the flavors and I think blue raspberry is the best by far! Helping me take my workout to the next level! This pre-workout taste amazing! It gives me tons of energy to make it through my workouts. It is not the first flavor I tried. The first was pineapple mango which was disgusting. They both gave me plenty of energy and helped me complete my workout but was hard to finish the pineapple mango. This one however was delicious and was super easy to finish! Will be only one I order from now on! I'm loving my blue raspberry pre workout. It gets me going for my workouts and helps keep me going all day without having to reach for a caffeinated beverage. The fat loss blend has been a big help in my strength training workouts as well. I have tried many different pre-workouts on the website before. This is by far the best flavor that i have tasted. I also bought the creatine from it too and i just mix them together and you definitely get the motivation and readiness to have a good hard workout. I highly recommend this product. I found this flavor to be very bitter. Overall, I like the product though. I only buy when on sale. Best pre workout out there. Great flavor too! It does its job but the taste is too sour for my liking. If you love sour this is for you! I absolutely LOVE this pre-workout and would recommend it to anyone! I ran out of this flavor a couple of weeks ago and I have been checking back every now and again to purchase some more, however it has not been available! I'm a little bummed out about it. It also seems as though their pre-workout flavors are decreasing. I'm not sure what this is all about? I was just wondering when this product would be available again and/or if they are planning on no longer making any pre-workout? I love this preworkout! It tastes like sour candy(my fave)! It also gives me the boost I need to finish my workout and really helps with my mood!